I’ve heard it said that 95% of the people that find you online aren’t going to buy from you anyway, so while you have their attention, why not serve them – give them something of tremendous value so they walk away with a positive feeling about you. This principle works perfectly with the marketing strategy known as “content marketing”. Content marketing is a method of creating and sharing valuable information to attract and convert prospects into customers, and customers into repeat buyers. The type of content you share is closely related to what you sell; in other words, you’re educating people so that they know, like, and trust you enough to do business with you. When we think about content marketing – the various tactics you can employ like blog posts, articles, white papers, webinars, offering valuable opinions and joining discussions in groups or forums, if you don’t have a strategy for getting clients to actually find your content, you may as well be writing in your journal. People buy what’s in front of them. When you employ a specific strategy for getting your content seen, it can pre-sell your prospects by building trust and credibility and value before they ever even meet you. 1. Buy and read Permission Marketing by Seth Godin. 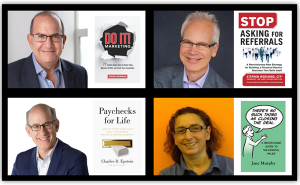 Permission marketing is a relatively new term, coined and developed by Seth Godin, and if you’re going to have success in using content marketing to attract and convert your audience, you need to read this book. 2. Define what your unique service model includes, then identify 10-12 topics you could write articles on that “set the buying criteria”. 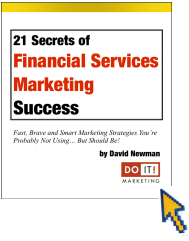 David Newman discusses the concept of “setting the buying criteria” in his e-book titled “21 Secrets of Financial Services Marketing Success” (download the e-book here). Here’s how it works. 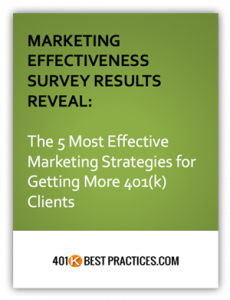 In your marketing material (email, brochures, web sites, sales letters, etc.) you define what makes a good buying decision – and in your definition you make sure that your firm is the only one that fits the definition – this is setting the buying criteria. You do this in such a way that it excludes your competitors. 3. Schedule, create and share one value content piece a week. Whether you create the content in-house, or outsource it, you should plan out your marketing efforts on a weekly schedule and stick to it. As you regularly publish valuable material, you position yourself as an authority in your niche and gain exposure to your audience. Don’t forget to include social sharing options on your articles and blog posts. 4. Add checklists, worksheets, PDFs, or other downloadable bonus items to your content. Download the complete 13-point checklist titled “13 Steps to Content Marketing Success” here. See how that works? By making additional information available – a checklist, a PDF for folks to print and keep, or another item relating to your article – you add additional value and collect contact information that allows you to add more value in the future. 5. Create and add a “Lead Magnet” to you website. If you visit this page (on this site), you’ll see that in exchange for your email address, I’ll send you 3 of my best strategy guides. These are examples of lead magnets, or an exchange of something of value to you (Strategy Guides) for something of value to me (your email address). 6. Use LinkedIn to publish your content. One time I posted an article on LinkedIn and received 1800 visitors to my blog – in one day! (My blog was 3 days old at the time with no promotion or exposure other than that article – imagine had I written a really good article on a wider topic that was picked up by Pulse!) Posting content to LinkedIn using the publisher option works. Posting educational articles in groups that you belong to and actively participate in also works. Remember the goal of content marketing is to attract and convert prospects into customers by providing educational information that is valuable to your audience.